Details: The Hunter Tweed Range of bedding gives a traditional feel of the country, with subtle earth colours. The mix of tweed and faux suede fabric textures offer a hard wearing bed with a comfortable feel. A real rustic charm! The Snuggle Bed is a rectangular shaped bed featuring deep filled fibre shoulders for enhanced comfort with a drop down front for easy access. The complete bed is fully washable and the base cushion is removable for that quick wash. 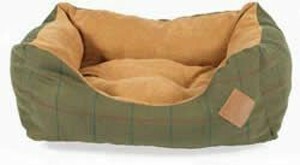 The Snuggle bed also features a non slip base.